Sport: The boats have really come into their own this weekend, as we finally wave bye bye to the last of the ice. The Northern shallows have fished fantastic with fish coming thick and fast. One of my favourite spots Cooks creek is according to Scott Stuffed with fish. Scott once again had a belting day with 15 fish coming to sparklers and orange blobs. The trick was a very slow figure of eight. Paul Davison and Steve Smalley had some 20 plus fish to their boat again the Causeway and the shallows produced the goods with black and green mini lures fished slowly on a Di 3 doing the trick. Top boat today however belonged toPhilip Pendlebury and his boat partnerwho had a staggering 33 trout between them! They found fish in amongst the Willows with Black and green doing the work once again. One thing that was a little unusual for this time of year however was that the found just as many fish fishing very deep water between Gull Island and the Willows. This is great news as it makes me believe that the fish are starting to spread out and indeed thaw out! Also scoring big was Andy fairweather who eaked 20 fish from along the shallows a fantstic result with the bulk of them falling to cats whiskers. 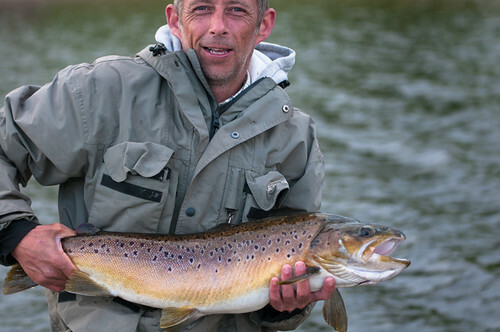 A settled week lies ahead and the fishing will only go from strength to strength. This entry was posted in Stocks Reservoir Fishing Reports on February 28, 2010 by Ben Dobson. This entry was posted in Stocks Reservoir Fishing Reports on February 27, 2010 by Ben Dobson. Sport: The big thaw has taken effect and the fish are coming round to these milder conditions. Andy Boylon and Duggy Ingles had a blinder with 26 fish to the boat including a specimen Rainbow from the top of Gull Island. Both guy’s fished black and green and green and white all day in many guises, one thing’s for sure though the fish seemed to want things nice and slow. They found a Di 3 at the most was deep enough with most coming on a slow intermediate. Steve Hilton and Dave O’gradey had a good day too with 12 to their boat. They spotted a clear spot of water along the dam and had some cracking sport all afternoon. Once again black and green did the trick! Bill Orrell is continuing his good form from last year with 11 fish all in a short afternoon visit. Bill fished a single sparsely tied black and silver double down in the newly thawed Hollin’s Bay, good angling Bill. Top rod honours today however goes to Michael Drake who fished from Bell Point round to Hollin’s landing an impressive 14 fish with many 3lb + rainbows. Hopefully the weather will remain kind this weekend and the sport will go from strength to strength. Ps I even saw some buzzers hatching today! This entry was posted in Stocks Reservoir Fishing Reports on February 26, 2010 by Ben Dobson. Sport: Today the ice was melting away. Although there were parts of frozen water the vast majority of the reservoir is now clear and with a reasonable wind blowing and slightly higher temperatures than we have seen of late the situation can only improve. There were some good catches made today with the majority of the fish caught being close to the shoreline. Regular bank angler Ray Entwistle landed 4 fine rainbows, one of which had a red tag on it, Ray is now the owner of a new scierra rod and very pleased he is too. Well done Ray. Len Ryding landed 6 rainbows including a super 7lb specimen that was taken on a lure from the two trees area near the jetty. Other bank anglers were also in amongst the trout with all areas from Hollins bay right round to Bell Point and beyond being productive with various lures mainly on sinking lines being best. On the boats those anglers that put their flies close to the bank or near to ice caught well, once again to lures on sinking lines, indeed the two best catches fell to boat anglers Sir Bob Cooper and Lee Cowking who both utilised the sinking line-lure combo to good effect landing 9 trout each from Hollins bay. See you on the water Paul. The reservoir is thawing! Tomorrow sees the temperatures rising so I am quietly confident that we should be fully clear by Friday. I can’t be 100% sure but I’m pretty confident. Boats can now leave the jetty safely without crossing any ice, and the whole of the east bank is totally clear. Ben’s beach, Bell Point and Barnes Quarry are all ice free for the roving bank angler. Please don’t hesitate to contact me at the lodge for an up to date review of the situation. One thing is for sure with the temperatures on the rise the fishing should switch on real soon and when it does we are in for a real treat! This entry was posted in Stocks Reservoir Fishing Reports on February 24, 2010 by Ben Dobson.